Sovereignty can be seen in two methods, nominal or titular forms in which authority lies on the name of the concerned only, and in the real sovereignty in which really uses his powers. The British monarch is the example for the nominal or titular type of sovereignty where the administration is done in his name, in fact, the exercise of powers are done by the Prime Minister and his Ministers and the President of India, also falls in the same group. Whereas the President of United States, France and other countries where President rules, one can observe the real sovereignty. They perform their duties according to their best judgment and are accountable to the state in any form of act they do and they really have the power to govern in the real sense. In this system of legal sovereignty, one has the power to create and implement the law, such law is binding on all persons who are concerned, and it can alter or cancelled by the same authority. The example for such type is British Parliament, where legal sovereign makes law according to its judgment. If legality takes into consideration, one thinks that it is all-powerful or omnipotent. In this system one must understand the differentiation between De Jure, means, legal and De Facto, means, factual or actual sovereignty. In de jure sovereign, inhabits office with firm laws of the state and gets subordination of the persons to such authority. In other sense it can be understand that, the execution of power to the office is done by the law. But in the case of de facto sovereign, it denotes that, the occupation to the highest office is in illegal or unconstitutional way and later he uses his powers to implement his will. It could be the result of war or insurgency in the country. According to Bryce, “The persons or body of persons who can make his or their will prevail whether with the law, (he or they) is (or are) the de facto ruler (or rulers), the person to whom obedience is actually paid”. In fact it establishes the real base for the democracy, because it gives the highest power to the people. During the times of Romans authority of commonwealth was from corporate power of the people, but in the mediaeval Rousseau, who gave idea of social contract which is laid on the grounds of general will of the people. Thomas Jefferson of United States, coined the idea of highest authority to the people, from then it has become the internal part of the democratic theory, however, in real run through it adopts the outline of political sovereignty. It can be observed that the explanation of sovereignty can be seen in the legal or juristic way. Because the will of the state can evident in the law of state that has a requisite feature. It is main reason the scholars such as, Hobbes and Bentham gave importance to the legal fact of opinion. English jurist, John Austin, in his work ‘The Province of Jurisprudence Determined’, he defines the term “If a determinate human superior, not in the habit of obedience to a like superior, receives habitual obedience from the bulk of a given society, that determinate human superior is the sovereign in that society and that society (including the superior) is a society political and independent”. Accordingly, two significant penalties are inferred. Power of the sovereign cannot be legally restricted, for clearly, the sovereign cannot be forced to act in a convinced way by any command of his own. Sovereignty cannot, firmly discourse, be legally separated between two or more persons, or bodies of persons acting distinctly, and because any such person or bodies of persons must have ex hypothesis powers legally restricted in certain ways. 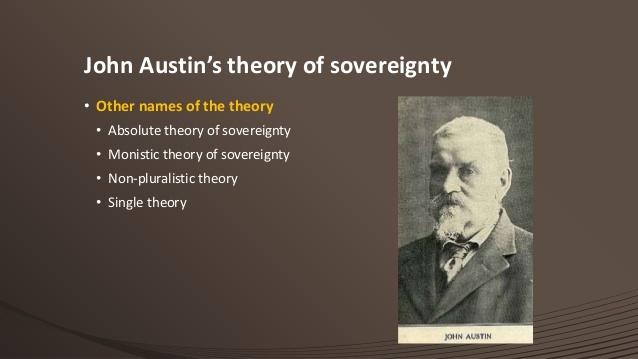 Some of the important conclusions can be drawn from the Austin’s nature of sovereignty of the state. 1 In every political community or state which seems to be independent, one can observe the absolute and supreme power with someone or persons and his will is the law of the state and every-one has to obedient to the law. 2 Sovereign is the one who determinates, that means the some persons or person holds the highest power with them and can execute their power according to their best judgment, they have the capacity to formulate and implement their will. Hence, sovereignty stands in the legal aspects only; talk of political sovereignty that is, supreme power of electorate; or the popular sovereignty, that is, supreme power of electorate is to composition with a falsehood. 3 Sovereignty cannot divided because it do not follow any other rule or authority, the will of sovereign is supreme over all its persons and associations residing in the state, but he is not controlled by anyone. 4 The sovereign gets customary submission from the majority of given community, means the submission becomes the substance of practice and not the sporadic procedure. 5 The command is the spirit of law and whatever sovereign wills it becomes the law, if anyone fails to do then it can punish according to law.